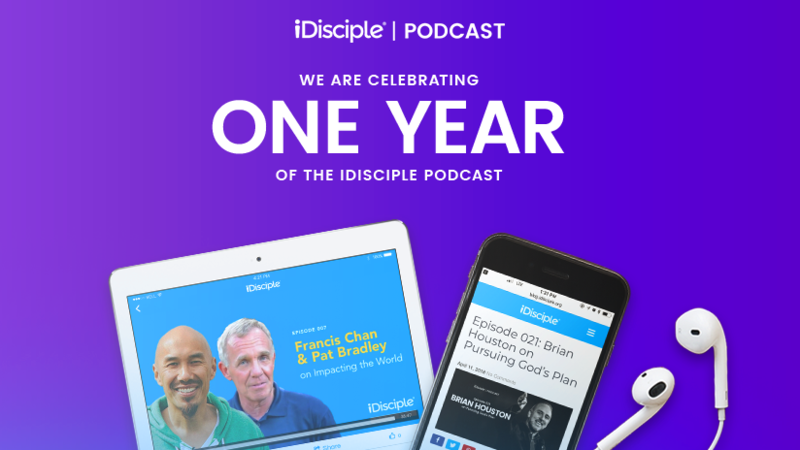 Hello and welcome to a special one-year anniversary episode of the iDisciple Podcast! It is hard to believe how fast time has flown by, but just over a year ago we launched the podcast with our first four episodes. Since last June, we have released 24 episodes featuring some of the most influential speakers, authors, pastors, and musicians in the faith community. In that time, we’ve had the pleasure of discussing a number of topics including parenting, finance, social justice, theology, and so much more! This week we are taking a look back over the year at some of our favorite moments and most thought-provoking discussions with guests like Francis Chan, Brian Houston, and Shaunti Feldhahn. If you’ve missed any of our first 24 episodes, subscribe to the iDisciple Podcast today on Apple Podcasts or the Google Play Store and catch up on all of the incredible conversations. We hope and pray that this one-year recap episode of the iDisciple Podcast brings you the biblical truth that you needed to hear, and that this week’s episode stirs your heart for the Lord! Francis Chan explains why it’s important that we live our present lives in a way that reflects the eternal promises of God. Atlanta-based musician Jimi Cravity discusses why Christians should be a driving force in shaping the culture around us. John Eldredge and John Bevere highlight some incredibly in-depth biblical truths from their newest books. Pastor Brian Houston from Hillsong Church teaches us some of the leadership lessons he learned early on that shaped his ministry. Some of our favorite parenting gurus, Karen Stubbs and Wynter Pitts, share how God has influenced and encouraged both of them as parents. Thank you so much for joining us on our journey the past year! We hope and pray that the iDisciple Podcast has had a profound impact on your walk with Christ. If you don’t already, subscribe to the iDisciple Podcast today on Apple Podcasts, Google Play, or wherever you listen to podcasts. While you’re there, leave us a rating and a review. We love to hear feedback from all of our subscribers! Check out our iDisciple Podcast blog posts to hear old episodes that you might have missed. Join us in changing the world in the name of Christ! If somebody in your life could benefit from hearing God’s truth on the iDisciple Podcast, please share this episode on your social media networks. To hear even more life-changing content from iDisciple’s Kingdom Partners, download the iDisciple app for your preferred mobile device today! Since 2013, iDisciple has been leading people into a closer relationship with God through music, sermons, and devotionals, all in the palm of your hand! Check out iDisciple to learn more. We are excited to kick off the next year of podcasts in a few weeks with special guest Lisa Bevere. We are so thankful for all of our listeners who have joined us on this journey the past year, and can’t wait for the years to come!